A fun story about friendship! When Max meets Bird, Max thinks he'd like to be friends with Bird. He would also like to chase Bird and maybe eat him as a tasty snack. But that's not what friendship is all about . . . Is it? 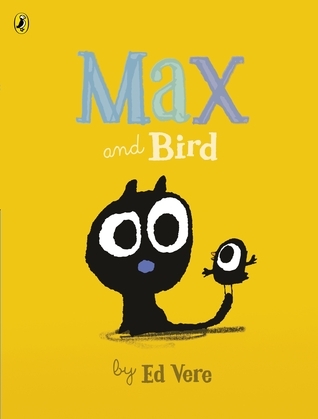 Max and Bird was written and illustrated by Ed Vere, and published in 2016 by Sourcebooks Jabberwocky. Birds get chased by kittens. I love the humor in the storytelling voice. This is a great example of a story that leaves space for the reader to think and form opinions as the story goes along. I would definitely study this one as an example of a picture book that includes a good balance of dialogue and action, with a clear problem and solution. The illustrations are bright and nicely designed -- perfect for read alouds. This is an entertaining story that could lead to discussions about persistence, following your dreams and friendship. I especially liked the ending, where Max can’t do what Bird does, but is there to support his friend anyway. Draw a picture of something you’d like to learn how to do. What steps would help you accomplish it? What is something you could help a friend to do? Try it! Make puppets to tell the story of Max and Bird, and act it out. Check out this live storytelling by the creator, Ed Vere, from the Scottish Book Trust. NOTE: This title has been nominated for a Cybils Award, and I am a first round panelist. There are many nominations and six other judges. My opinions should not be construed as a sign of inclusion or exclusion on the final short list. Not all picture books can clearly show a problem and resolution. This sounds like a fun story. I love how you think you could use it in the classroom. That cover really pops! I'm thinking kids will love this book based on the illustrations, alone. And the text, although quite straightforward, sounds a bit wry. Looking forward to checking it out. Thanks for the tip!